More and more frequently, I’m running into articles and snippets that feature some element of Environmental Psychology, the relationship between people and the spaces they occupy. What such a study would make of The Montague and the shadows that pass behind the peep-hole of room 213 I couldn’t even imagine. Then again, maybe no study is needed if Michael Schutz-Ryan's Blood Vengeance covers all the bases. Sick of being bullied, seventeen-year-old Brennan Cooper packs up for San Francisco to start over. But before he can settle into his new home, Bren is drawn to the abandoned apartment downstairs. In its shabby rooms, he sees the grey and rotting ghosts of murdered girls claw each other in sick imitation of their deaths. With his wild new friends, Brennan explores the seedy streets of the city. But the laughter and screams downstairs continue to both terrify and entrance him. After meeting Tara, his dream girl, he convinces her to explore the downstairs apartment with him. There they encounter not only the murdered victims but the raging spirit of the girls’ dead killer. Bren and Tara’s ghost-hunt soon becomes a manhunt as they trace the history of the “San Francisco Ripper.” But retaliation for their meddling is quick and brutal. Now time is running out, not just for Brennan and his friends, but for the spirits of the girls trapped for all those years with their murderer. Brennan is an immediately likeable character, his lack of confidence and bookish nature will more than likely resonate with anyone who remembers what it’s like growing-up as an awkward outsider. He gets on really well at his new home so it’s a real shame that paranormal shenanigans get in the way. He starts to become the person he wants to be, makes new friends and lives a better life, but always has nagging nightmarish fears and thoughts. The topic of these thoughts is what is going on one floor down in the dilapidated hotel where he now lives with his Uncle Marc. There is a varied cast of other characters, his new friends all have their own distinct voices, mannerisms and secrets, and other more peripheral characters are all different enough to stick in the mind and add something to the tale. The setting of San Francisco is brought to life by Michael Schutz-Ryan’s words and you are never in any doubt about where things are happening nor left mentally scrabbling for orientation, except in those scenes where that is the desired outcome! The group of friends seems to go from misfortune to misfortune, on the surface being down to personal choices but on another level, Brennan suspects an outside influence. Things escalate as the book continues, the situations becoming more and more life-threatening. Michael Schutz-Ryan does an excellent job of taking the ordinary and twisting it into something more sinister. There is a particularly good situation in the last third of the book that in another guise, would be a happy Disney style event. No such luck for the poor soul in this story. 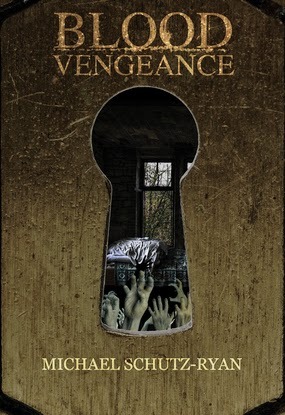 Blood Vengeance is an easy read, the chapters flying by at an interesting pace with enough background detail to pull you in, and enough points of interest to keep you there for as long as the ride continues. I rate it 5/5, it’s one of the fastest book reads I have achieved in recent times and I think the way that Michael builds things up and creates oppressive feelings is very well done indeed. If you like horror, pick up Blood Vengeance now. I was given a free copy of the book to review.